Let us tailor a delightful walking holiday to Tanzania, combined with wildlife viewing in the Serengeti Wilderness Area and a relaxing beach stay in Zanzibar. Stay in a variety of luxury camps and an award winning beach resort. Fly to Kilimanjaro airport. Transfer to Itikoni Camp, Arusha National Park. Day walks to see crater and waterfalls – and plenty of wildlife of course. Game drive in Lake Manyara National Park. Drive to Ngorongoro Highlands. Game drive in Ngorongoro Crater. Visit Masai village. Stay in the luxury tented camp. Drive to Serengeti. Game drive and wilderness walking safari staying in the luxury mobile camp. Drive to airstrip at Seronera. Fly from Serengeti to Zanzibar via Arusha. Transfer to the beach resort. Stay in a fabulous hotel with full amenities, including a spa and scuba diving. centre. From the dusty plains of Tanzania, to the highest peak in Africa. This itinerary will suit active people looking for a challenging trek. Why not add a wildlife safari on to the end of your Kilimanjaro trek. Fly to Kilimanjaro. Transfer to hotel. Drive to Londrossi Gate and begin the trek. 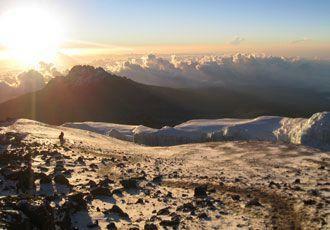 We prefer the longer Lemosho route to the summit of Kilimanjaro, with extended acclimatisation time. Trek via Shira camp, Great Barranco Valley, Karanga and Barafu. An early start to reach Kilimanjaro summit for sunrise over the African plains. Descend and end trek. Transfer to the hotel. Time to relax after your strenuous trek. Drive to Tarangiri National Park. Game drive in the park. Game drive in Lake Manyara National Park home of the tree climbing lions and many other species of animals and birds. Drive up the rift valley escarpment and on towards Ngorongoro. Full day's game drive in Ngorongoro Crater. Drive to Arusha. Spend the morning at leisure at your hotel before transferring to the airport for your international flight home.